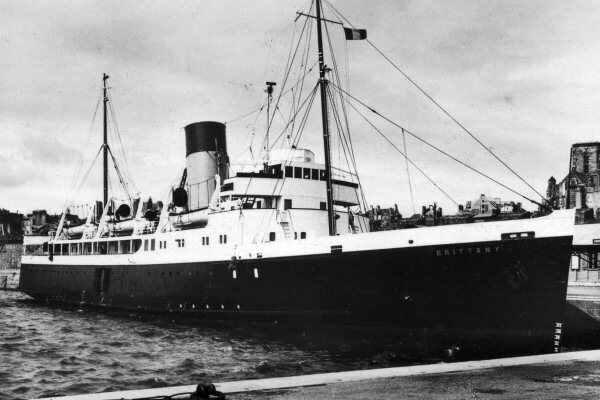 The Brittany was built in 1933 by William Denny & Brothers at Dumbarton on the River Clyde in Scotland. She provided for the Southern Railways, a service between Jersey and Guernsey and french ports of Saint-Malo, Granville and Cherbourg. Indeed, her draught allowed her to attend these ports where tidal is very important. At the beginning of the war, Brittany participated in evacuations, and then was operated by the British army on the African and Indian coasts. At the end of the war, she resumed his service in Saint-Malo, assisted by a new vessel, S.S. Falaise. She left the service and the British Railways in 1962. She then began a second career under the name Ålandsfärjan in the waters of the Baltic Sea, after being converted into car ferry. She then sailed for Viking Line. After aground near Stockholm, she was withdrawn from service in 1972 because she would have been too expensive to repair, and was demolished in Salo, Finland.